Statistics have shown that the majority of theft and burglaries from private property is committed by amateurs and opportunists, rather than professionals. Taking just a few steps to make your home is visibly less attractive to potential thieves can save the heartbreak and stress of a break-in. Here are our top tips for securing your garage, home and garden from intruders. Check that doors and windows close and lock properly, and are kept in good condition. Single-glazing and damaged or incorrectly fitted locks will leave your property vulnerable. 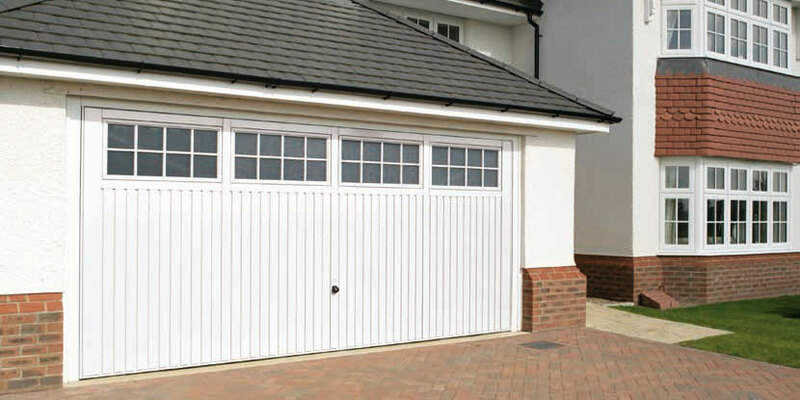 Don’t forget to check internal doors to garages, conservatories or side-buildings. Think creatively about possible entry points. Just because you wouldn’t clamber up on to your extension to get in through a bathroom window doesn’t mean that an athletic youth doesn’t see it as a challenge. Make sure cat flaps and doggy doors are locked when not in use. Your most valuable items may not be inside your house, so make sure that you have a secure lock on your garden shed and keep your garage doors in tip-top condition. If they’re looking a little worse for wear, it might be time to upgrade them to a set of secure steel garage doors with a modern locking mechanism to keep unwanted guests out. Keep expensive items – including vehicles, tools, furniture etc. – out of plain view. Think about how you dispose of the packaging for these items, too; leaving boxes for high-end goods next to your wheelie bin will alert passers-by that it’s now in your home. Maintain hedgerows. Large gaps in foliage can provide an access point, while overgrown plants will hide your property – and burglars – from view of the street. If you have a tall fence, consider growing thorny climbers up one side so it cannot be easily scaled. Install a visible security system, which can both act as a deterrent and sound an alarm in the event of a break in. Keep security codes updated regularly, so that few people know the current code and that worn key panels don’t give it away. Fit a motion-sensor security light to make it difficult for intruders to sneak up on the building or hide in gardens. Gravel pathways are also good for this purpose. Be aware of anything in your garden (or against your garden walls) that could be used to gain access over your fence or into the building. Common items include storage containers, wheelie bins, ladders or overhanging trees. Tidy these away, trim these back or make sure they are otherwise secure.